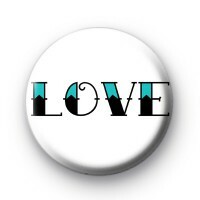 Old School Tattoo Love Font Badge in white with Love written in a light blue and black tattoo style font. This is an old school tattoo style text badge with a circus font. We have a range of tattoo artist inspired button badges available and all of our badges are made by hand in our UK workshop.